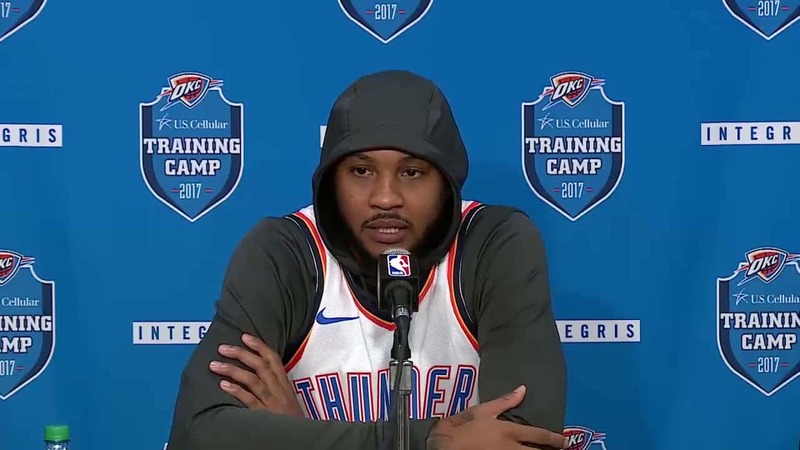 After an underwhelming season with the Oklahoma City Thunder, Carmelo Anthony is ready for the next chapter in his career. The 34-year-old was recently traded to the Atlanta Hawks for Dennis Schroder but is expected to be waived prior to the start of the NBA season. Where exactly Melo plays is still up in the air, but the 10-time All-Star is certain of one thing. A team that wants him to come off the bench won’t sit at the table long when he’s fielding offers. Speaking to Jemele Hill of The Undefeated, Anthony addressed the issue and didn’t hold back when evaluating his worth. Clearly, Anthony has no intention of coming off the bench, despite coming off the worst season of his career. The 6’8″ wing averaged a career-low 16.2 points per game while featuring in just over 32 minutes of action per night. Not only was Anthony’s scoring down, but so was his efficiency as he recorded career-lows for both his field goal and free throw percentage. This is the same player who laughed at the notion that he could come off the bench at the beginning of the 2016/17 season. Many predict that Melo could be headed to Houston to join forces with fellow banana boat pal Chris Paul and reigning MVP James Harden. But that fit might not be as perfect as many people think. The Rockets lost Trevor Ariza in the early days of free agency and are still yet to re-sign Clint Capela, who is currently a restricted free agent. Ariza was certainly inconsistent on offence and often struggled to find his rhythm, but the 33-year-old brought plenty of the defensive side of the ball. Now that he’s headed to Phoenix, the Rockets have no viable wing defender, especially with Luc Mbah a Moute heading to the Clippers. With Melo essentially demanding a starting spot, the Rockets defence could take a significant hit. Just last season, Mike D’Antoni’s side ranked sixth in the league for points allowed per 100 possessions, an astonishing feat for a team that prides itself on its run-and-gun offence. Anthony may have been an offensive juggernaut while with the Nuggets and Knicks, but times have certainly changed. If the Rockets could convince Melo to take on a bench role, it would make him the go-to scorer of the second unit and satisfy his desire to have the ball in his hands at all times. But above all else, it could be the key to the Rockets finally winning an NBA title. He’s not the only player who will be donning a new uniform this season, with Vince Carter signing a new one-year deal with Atlanta.